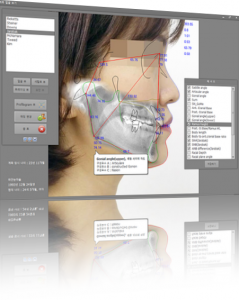 This software measures and analyzes Cephalometric X-ray and model of orthodontic patient. It simulates and predicts facial change (lip protrusion change) before and after treatment. You can freely mark and draw on the computer screen with marker pen and highlighter. This is useful for presentation, seminar and study group. This software creates a five division image used to dental treatment cases. You can easily adjust the image size and position in the grid with the mouse.